Venom is often considered to be the best villain in Spider-Man’s gallery of rogues that contain awesome ones like Doctor Octopus, Kraven the Hunter, Rhino, Electro, Sandman, Vulture and the Green Goblin amongst many others. Despite that, the character hasn’t been given proper treatment on the silver screen. 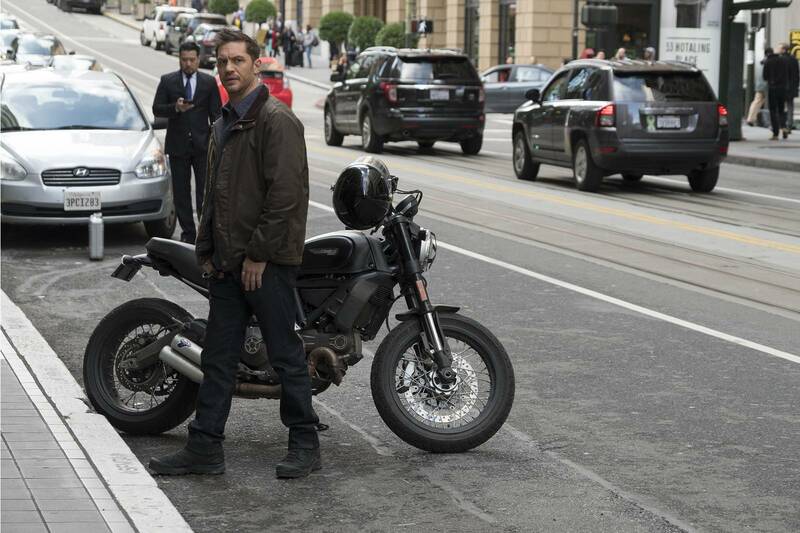 The Last time he was last seen on in a live-action movie was in the 2007 conclusion of Sam Raimi’s Spider-Man 3 where he was shoehorned as the last villain in a film burdened with too many of them which meant that Topher Grace’s interpretation is often regarded as the worst aspect of Sam Raimi’s Spider-Man trilogy. Today’s movie was originally slated to be a spin-off to the Amazing Spider-Man series of films that was kicked off by Andrew Garfield in 2012, that was promptly buried six feet under like Uncle Ben after its star-studded mess of a sequel was released in 2014. Amazing Spider-Man 2 was more concerned with kickstarting it’s Amazing Spider-man Universe rather than tell a complete story in a bid to cash off the movie universe craze that Marvel cinematic universe had popularized. Amazing Spider-Man 2 underperformed with the critics and box-office alike which forced Sony, the current holders to the film rights of Spider-Man and all characters derived from him to cut a deal with Marvel Studios. 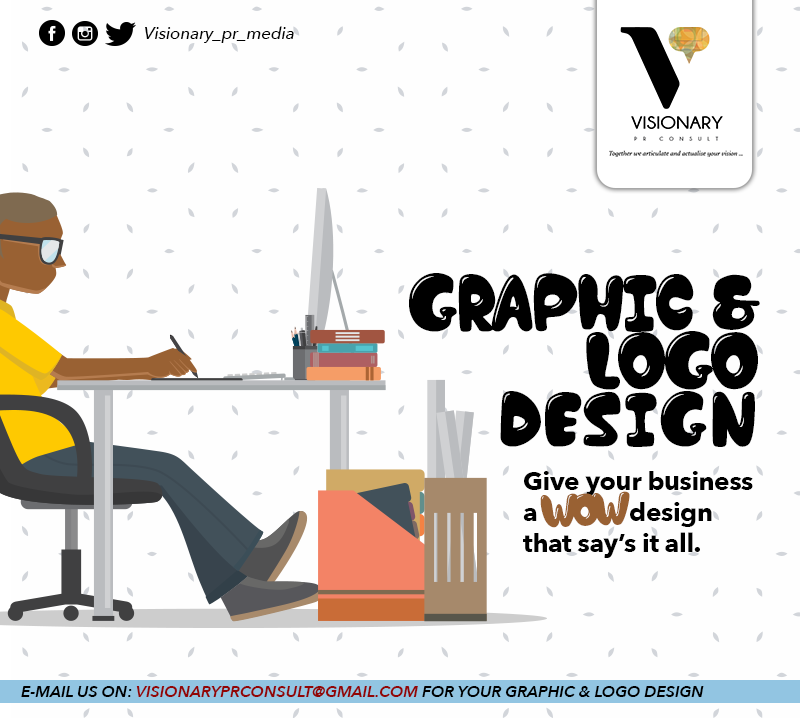 This partnership brought the web crawler to the Marvel Cinematic universe and in return, they would produce the films for Sony. This has been proven to be a fruitful partnership as Tom Holland introduction as Spider-Man in Captain America: Civil War was well received and his further performances as your friendly neighborhood wall-crawler in Spider-Man Homecoming and Avengers: Infinity War have strongly cemented Spider-man as one of the best characters in the MCU, a universe rich with amazing films and characters who have become pop culture icons in their own right. It only made sense for Sony to halt their own plans for spin-offs featuring characters from Spidey’s gallery of rogues and allies but this movie and the upcoming Spider-Man: Into the Spider-Verse prove otherwise. 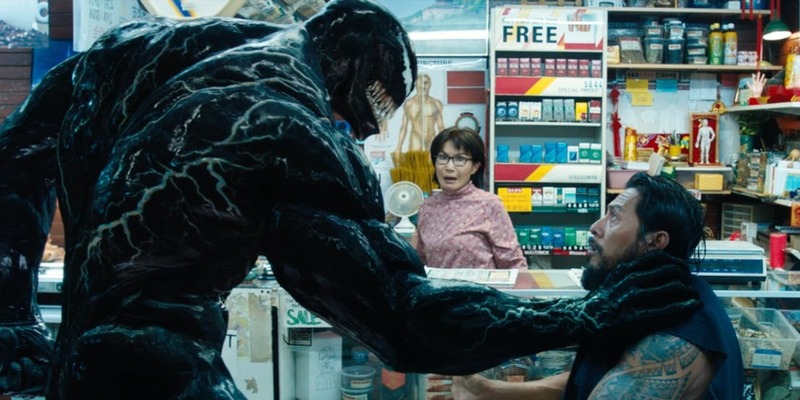 The film was brought back from the grave in March 2016, Avi Arad and Matt Tolmach envisioned Venom as a new film franchise that is not related to the MCU or the was previously mentioned Amazing Spider-Man films. This bold new direction foregoes the fact that Venom origins are tied to Peter Parker/ Spider-Man. For those who aren’t familiar, Venom is a product of a race of extra-terrestrial Symbiotes who live through the possession of other life forms. They gift their victims with enhanced abilities in exchange of totally draining their host of adrenaline and control of their body. The symbiote made its debut in the Marvel comics event called Secret Wars, where Spider-Man comes in contact with the symbiote after his original costume was badly damaged. The alien bonds itself to his suit which enhances Spider-Man’s abilities while hooking him up with a cool black variation of his classic costume. Despite the added power, the suit proves to be a dangerous affair as it permanently tries to bond itself with Peter Parker and take over his mind. He rejects the suit after a lengthy mental battle and the symbiote dedicates itself to killing Peter Parker/ Spider-Man. It eventually joins forces with Eddie Brock a journalist who shares the same sentiment after Parker exposes him for falsifying a story which costs him his job and marriage. The symbiote even endows Brock with Spider-Man’s power since Spider-man was his previous host. Ever since Eddie Brock/ Venom has proved himself to be one of Spider-Man’s most dangerous villains to date. Taking story beats from the comic Venom: Lethal protector and Planet of the Symbiotes, Venom tells the story of Eddie Brock (Tom Hardy) an investigative journalist who moves to San Francisco after a scandal forces him out of New York. He is on the path of resuscitating his career when he starts working for a forward-thinking cable news channel who gives him his own show “The Eddie Brock Report” which puts him out on the streets to take on pieces that other people won’t. Eddie sees himself as a fearless reporter who defends the people through investigative journalism against big corporations by asking the questions people would not. This mindset gets him in trouble when he is handed a fluff piece interview on corporate fat cat Carlton Drake (Riz Ahmed) of the Life Foundation, a company dedicated to finding solutions for the betterment of human lives through experiments to extend the lives of cancer patients. Using evidence discovered by his girlfriend Anne Weying (Michelle Williams), an attorney that represents the foundation, Eddie decides not to pull his punches in his line of questioning and as a result, gets fired from his job and also gets his girlfriend axed during the process. When he is left on the streets to rot, a mysterious Dr. Dora Skirth (Jenny Slate) approaches him to tell him that the company is conducting dubious experiments with a life form known as the symbiote that merges with human hosts and kills them during the process. Eddie decides to continue his investigation and is eventually infected a symbiote that calls itself to him as Venom. Venom gives Eddie superhuman strength, healing powers, and conveniently takes over Eddie’s body and aids him in combat. In some occasions, Venom just takes full control and turns Eddie into a hulking, black-and-white monster with a bloodthirsty appetite for humans. Venom is also, unfortunately, killing Eddie from within like a virus. With Drake’s henchmen out to capture the symbiote, Eddie must find a way to cure himself of his ailment and stop the nefarious scheme that the life foundation is cooking up. With a cast featuring the likes of Tom Hardy, Michelle Williams and Riz Ahmed under the helm of Reuben Fleischer who directed films such as Zombie Land and Gangster Squad, does Sony ‘s risky experiment succeed? Tom Hardy once again proves why he is one of the best actors in town. He manages to rise above this mediocre script and dialogue and salvage a very good performance out of this movie, a feat a lesser man would have crumbled taking this role. He portrays Eddie as a likable rogue who is the everyman with a little strut. He chooses to fight for the little guy as he seeks to protect the public with his hard-hitting journalism. Despite his arrogance, he is still a character that oozes charm and ends up being one that you can ultimately root for thanks to Hardy’s portrayal. The Eddie Brock and Venom (who is also voiced by Hardy) dynamic is definitely the best thing about the movie. 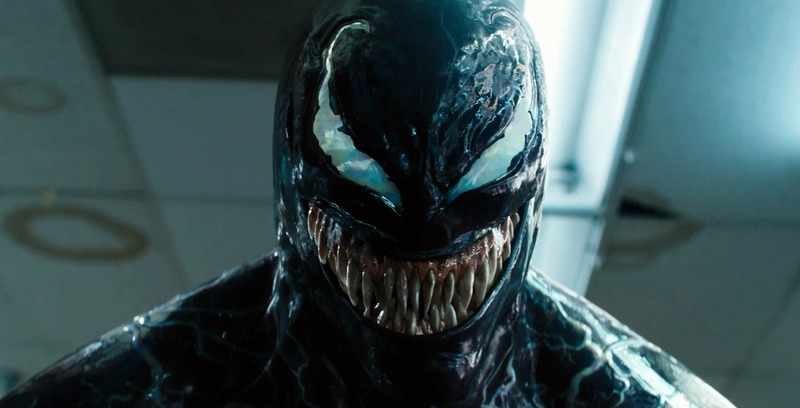 It creates the film’s biggest laughs and is weirdly enough respecting the source material as Venom himself is a weird creature with a sense of humor as he makes remarks like “on my planet, I am a loser just like you!” or “Let’s eat their heads”. Tom Hardy once again shows that he can act with himself when Brock starts bumbling his way through San Francisco arguing about what to eat or how they should solve a problem. He also manages to make us feel his pain as he convincingly lets himself lose control when he has to convey the fact that he is in a constant battle with something that is trying to devour his body. One of the worst things about Sam Raimi’s Spider-Man 3 was the look and design of venom. This movie does the character justice, despite the fact a significant element of the character’s design is missing. For the most part, He looks like his comic book counterpart and is without a doubt the best-looking version of the character we have seen on the silver screen and is arguably worth the price of admission for the few scenes we get to see the creature. Being a huge fan of Spider-Man, it’s really hard going into this movie knowing that it is a hollow shell of what it could be. As previously mentioned, Venom’s birth is tied to Spider-Man as the creature in question and Brock is often depicted as a vengeful beast that is fueled by their animosity towards Peter Parker. Even though the comics eventually dropped this particular motivation and turned him into an anti-hero it’s hard to see a movie that tries to sweep this nugget of information under the rug. The movies decision not to acknowledge the existence of Spider-Man, as a result, creates narrative gaps which the film doesn’t attempt to cover without any good explanation or through lame excuses. For example, the symbiote names itself Venom as it sees itself as a poison to Peter Parker/Spider-Man, in this movie the symbiote just calls itself venom other than the fact that its name and his motivation for bonding with Brock and helping him is laughably bad. The supporting cast featuring the likes of Michelle Williams, Jenny Slate and Riz Ahmed should lift this movie to further heights but they end up becoming cannon fodder. Michelle William plays the love interest that doesn’t serve any purpose other than to move the story forward. Her chemistry with Hardy is non-existent and watching them interact with each other was a little painful to watch. 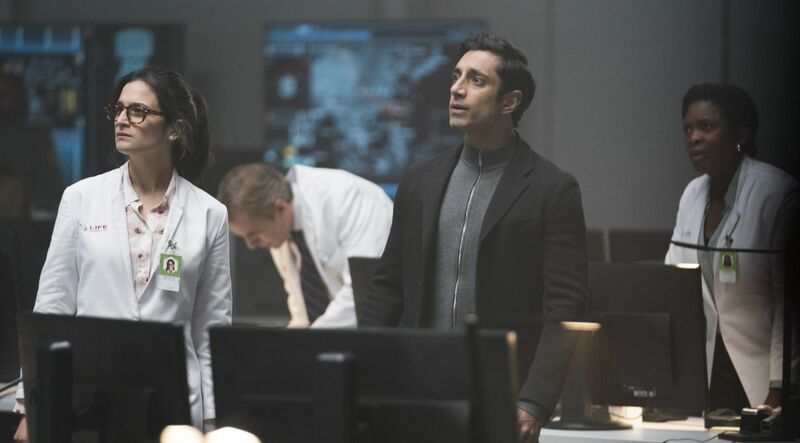 Riz Ahmed is another great talent wasted as he is forced to play your archetypal overzealous billionaire tycoon who wants take over the world for reasons that are horribly cliched. It’s a shame considering this year we’ve had superhero movies with great villains who have great motivations like Kilmonger and Thanos. We live in an era where R-rated superhero movies can thrive if the box office numbers of Deadpool and its sequel and Logan show. The mere process of symbiote attaching itself to a host, in theory, is quite gruesome and some of the actions that venom and other symbiotes perform in the movie are quite visceral but the movie cuts out the residue of said actions with bad-editing and it ultimately harms the film. While some of the effects were impressive, some just looked cheap and some of the other sequences featuring more than one symbiote took me back to Bay’s Transformers film where you really can’t see action and one that will give you great difficulties distinguishing the creatures. This movie is surprisingly light on action sequences and maybe other than the one that features a chase scene, most of them aren’t particularly memorable, but they do highlight venoms abilities in a respectable manner. Tom Hardy’s performance as Eddy Brock and Venom pull this movie from the pit of rancidness to bring you a heavily flawed but watchable superhero flick that isn’t dissimilar to a superhero movie of the early 2000s. In a year that has given us great films in this genre, this a missed opportunity to be something more.